Session on Yemen-U.S. Relations in Focus with H.E. 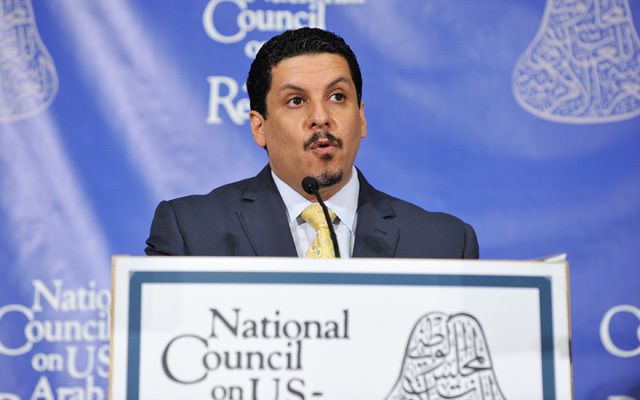 Ambassador Ahmed Awad Bin Mubarak, from the National Council on U.S.-Arab Relations’ 24th Annual Arab-US Policymakers’ Conference, “U.S.-Arab Relations at a Crossroads: What Paths Forward?,” on October 15, 2015, in Washington, DC. Dr. John Duke Anthony spoke to CNN about possible peace talk strategies between Yemeni militia and the Houthis. Dr. Abdel Aziz Abu Hamad Aluwaisheg – Assistant Secretary General for Negotiations and Strategic Dialogue, Gulf Cooperation Council. Dr. Abdulkhaleq Abdulla – Professor of Political Science, United Arab Emirates University (Abu Dhabi); lead author, 2008 Arab Knowledge Report. Dr. Abdullah K. Al-Shayji – Chairman, Department of Political Science, Kuwait University; author, Kuwait’s Ceaseless Quest for Survival in a Hostile Environment.